Vijayapatham motivation programme was organised for SSC students. The district administration started programme for the improvement of SSC exam results and further to inculcate confidence among the students through professionals. The Guntur Zilla Parishad is supplying study material to the SSC students and a 40-day action plan was formulated under which teachers are taking extra classes to hone the study skills of the students to achieve good marks in the SSC exams. The Vijayapatham programme was conducted on Tuesday in Guntur Medical College auditorium. 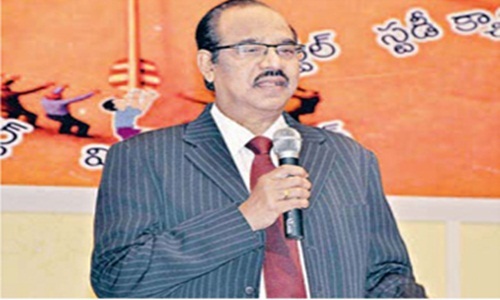 Minister for social welfare, R. Kishorebabu, inaugurating the programme, asserted on “education without fear” and said that the government was conducting motivation programme through famous hypnotist and psychologist B.V. Pattabhiram to help the students of government schools. He claimed that the government was spending huge funds to provide good education through state schools and sought success to all students of state schools in the SSC exams with the help of Vijayapatham programme. Mr Kishorebabu said that education is important for development and added that the government will send worthy merit students to foreign countries for higher studies. He said that recently, the state government sent 120 merit students to various foreign countries and soon will send another 150 merit students. He asked that students to make good use of the scheme to get higher studies of foreign countries free of cost. Famous hypnotist and psychologist Pattabhiram motivated the students through his speech giving the examples of historical personalities who achieved top place in the society due to education. He also cleared the doubts of the students. *Renowned hypnotist Dr B.V. Pattabhiram conducts motivation classes to SSC students during Vijayapadham programme at Guntur on Tuesday.